Filed under “How is this possible?” analysts are at a loss to explain how the stock market continues to rally amid an exodus of investors in U.S. equity funds. U.S. stocks posted their best quarter in nearly a decade at the end of March, but they did so without the help of investors in U.S. stock mutual funds and exchange-traded funds. According to data from Lipper and EPFR Global, those funds have seen sizeable outflows since the beginning of the year. Jared Woodward, investment strategist at Bank of America Merrill Lynch (and the source for the chart below), said although it isn’t unprecedented for equity fund flows to be negative while stock prices climbed, the pace and magnitude of the stock market’s rise and equity outflows are much greater so far this year. 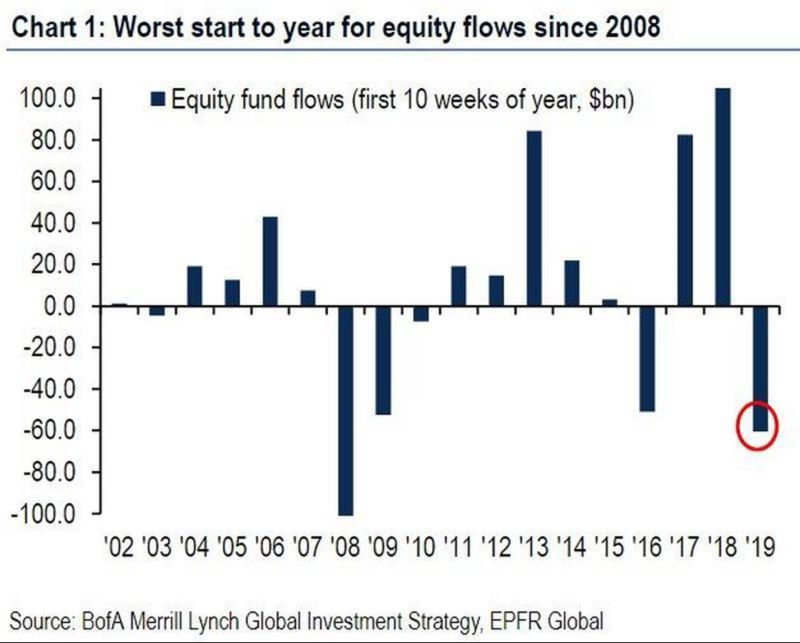 Back in 2016, equity outflows totaled $93 billion, but the accompanying 5% rise in global stocks was far less potent than this current period, the analyst said. Woodward and his colleagues theorized that the divergence between outflows and concurrent outsize gains can perhaps be explained by corporate buybacks. S&P 500 firms have repurchased $227 billion of their own stock in the first quarter of 2019, according to FactSet data, up sharply from the already-huge $143 billion in buybacks in the first quarter of 2018.